This month I have sincerely tried to be more conscientious of my driving. I don't live in a downtown area - I guess that's called the suburbs. :-) This means that given the distance to stores and such and in this beautiful hot weather, I mostly find myself driving to the store/errands and such. However, there are changes that I have tried to implement. 1. I have tried my best to visit the grocery store once a week. (Saving money and polluting less). 2. I went to the bank this week and didn't idle while at the drive thru window! I've become more aware of idling through this process and have tried to cut back as much as possible. 4. I have made lists of places I need to visit on a specific day. This has saved emissions, but also tired my little boy a lot more, too! This also means, that I have had more stay-at-home days than when I'm not paying attention to my driving. 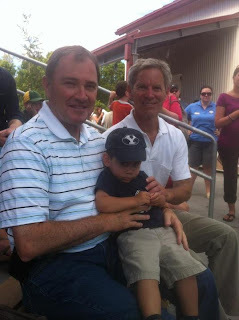 My son with the Governor & SLC Mayor. Governor H said, "He's not impressed to meet us". According to the Utah Division of Air Quality, if all drivers living along the Wasatch Front were to park their cars just one day per week, vehicle emissions would be reduced by 6,500 tons per year. This means that every vehicle trip counts, and every mile you devote to smarter travel pays Utah back with cleaner, more breathable air. And: Don't leave cars idling! I know it's hard, but we can do it!